The ‘All-Electric’ PL100EPr provides a highly accurate and reliable feed and peel system of virtually any shape of die-cut adhesive component. No pneumatics simplifies setup and maintenance. It provides capacity for components up to 100 x 100mm in size. 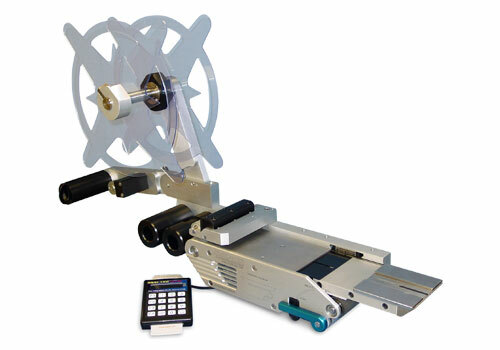 The EP Package provides maximum accuracy with measured results as good as +/- 0.035mm. The EP Package incorporates a ‘closed-loop’ feedback system to monitor travel of the material and verify the correct feed location at an increased resolution as compared to the standard PL100r. The PL100EPr is configured specifically for integration into automated assembly solutions. It includes all of the hardware necessary for operation including a pneumatic precision-guided Tamp actuator assembly, a Payoff assembly, and a powered Takeup (rewind) assembly. Custom Component Tooling (CCT) is the tooling package configured specifically for your die-cut component. The CCT items consist of a Vacuum Chuck, Blade Guide Pad, and Liner Guide Roller. All CCT items are customized per the specifications of your material and are configured for rapid changeover which means no tools are required to remove or replace the tooling.